SanDisk microSDXC 64GB for $24.99! You are at:Home»DEALS»SanDisk microSDXC 64GB for $24.99! 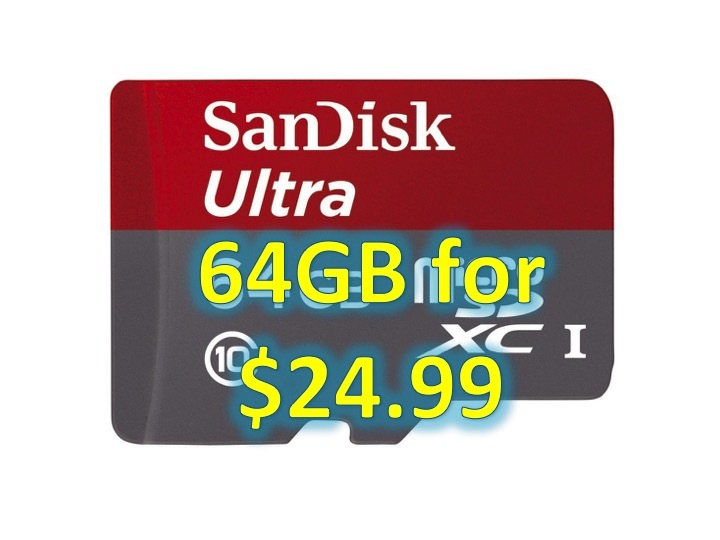 For a limited time, you can purchase a 64GB SanDisk microSD card for $24.99! Also comes with free shipping if you have Amazon Prime. This microSD comes with a 10 year warranty and also a SD adapter. This is compatible with tablets and smartphones which accept a microSD. With the adapter, this will fit most DSLR cameras, laptops – even that MacBook Pro (not the new MacBook). If you’re looking to spend less, you can also buy a 32GB for $13.99. If you’re looking for more storage, the 128GB version is on sale for $79.99. This particular item has over 8,000+ reviews with 4.5/5.0 stars from Amazon. We love our deals here at Asian Geek Squad – don’t forget to follow us on social media!